Quality Fence builds high-quality field fencing and gate systems that are attractive, secure and long-lasting. Field fence is one of the three fence styles that Quality Fence has installed in Southern Oregon since 1965, and this style of fencing has made a unique name for itself in this region. Field fencing is the least expensive yet durable option of fencing for large areas, and is primarily used for property definition, protecting livestock, orchards, gardens and vineyards. All work is customized and performed on-site to ensure a perfect match of the land contours. Four strand barbed wire fence is great for property definition. Our 2 rail timberline fence is one of the most attractive profiles for farm and ranch. 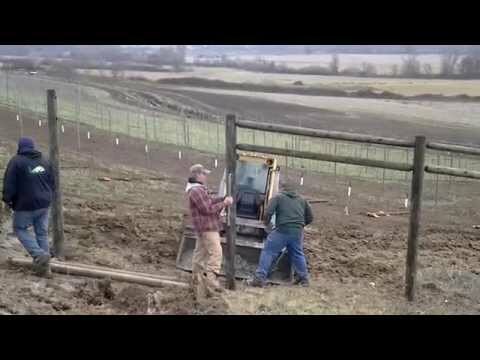 Field fencing can follow the slopes and contours of your property. Upgrade your galvanized gate to powder-coated as it can match the wooden post color. Thinking about a garden? Our 8′ high field fence can answer your problems.